And yes, it is available now. I like it fine, but I do understand how many of you out there will sport it during spring tennis. But yeah, I find it be pretty straight-forward and business-like, much like the team itself. I don't love it, but I don't hate it. I would like it a lot more without buttons and with a shorter placket. This looks like a golf shirt. All this said, I can't believe this is the best they can do having 4 years to design it. 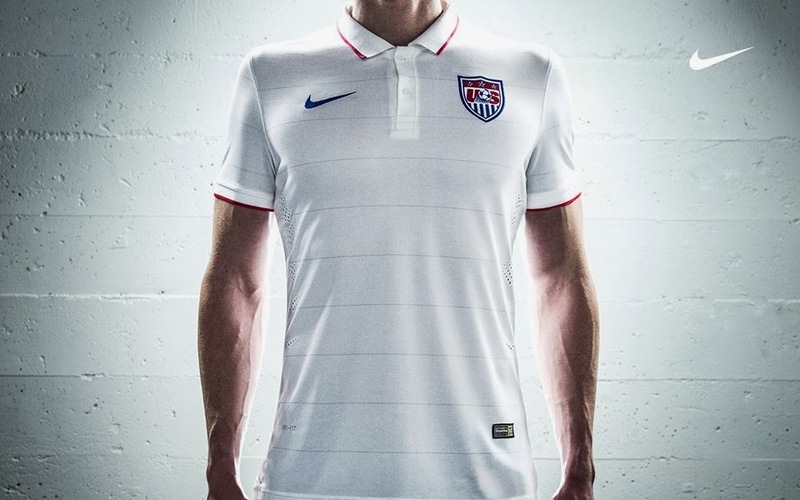 Who are the kunckleheads at Nike/US Soccer that are entrusted with this? This has been said many times before by many different folks, but US Soccer can't figure out how to project a consistent theme in their kits. I know that's easier said than done, and maybe part of what makes some of the more notable kits notable is the traditional success of the teams that wear them (Argentina, Brazil, Germany, Netherlands, e.g. ), but come on. We are the Stars and Stripes; the Red, White, and Blue. Start there. That's a lot to work with conceptually. That this is what they come up with is kind of pathetic. End o' rant. I like it, but then I like a good simple collared jersey. They probably always had me with this one. I like a simple collared jersey too Greg, but IMO the buttons complicate the design. The more I look at/think about them, the more I think they're terrible. They aren't terrible... better than the Miss Americas, that is for sure. Still wish we were wearing the Centennials for the WC, howev. Worst part of the jersey is the crest, otherwise I like them. White Stars v. Black Stars. Make that "Nike", not "mike"
Look back at the 2002-2006-2010 WC Jerseys. This is significantly better than all of those. This would be significantly better with a different crest - Centennial or otherwise. If they'd spent as much time working on that as they did on UV text/lettering...which no human eye will ever see during the course of play...it would have been better. Instead it's a polo that you could buy at any golf course. When they re-did the development academy logo... I was like, "OK... F-that. Make that the US Soccer crest..." It's far superior, modern and simple. I wouldn't mind if we always had a white variant and then an away/alternate in a set color. Buuuuut, we don't. Or, I guess we have blue? Except for when we use red (which the fanbase appears to love -- hmm, take a hint US Soccer). Seeing Croatia's latest release makes me wish we would just always do some kind of red/white hoops. I might never buy one, but at least we would own our identity. If the game does happen with Ukraine, USA should ask to wear ukraines away jersey for the game. Perhaps a nice thought, but they did just reveal the new shirt, so I would imagine they are contracted to wear it Wednesday. im sure phil knight would not mind unveiling the world cup jersey against our biggest rival next month. that sure makes a lot more sense. although, Ukraine does probably wear addidas, so, they will have to wear them under the usa jersey, but put them on, just before kickoff, in a show of solidarity. I wonder how much of the 1 billion USD goes to the Ukraine football federation? game on, putin was just flexing his muscles, and probably making some money with the stock market in flux. Allow me to remind you that any and all political comments or discussions are not kosher here. Thanks.